By combining an industry first, patent pending, clear coat with a tried and true aliphatic polyurethane resin, PremiumShield products are the ideal protective film for any surface. With the only kits that “”wrap” your exposed edges, PremiumShield continues to be the industry leader in paint protection for your vehicle. PremiumShield has been tested worldwide with results that prove time and time again, that our products are the clearest, strongest paint protection film on the market. We are so confident, we give it a lifetime warranty. With today’s environmentally friendly paint systems, minor impacts into hard surfaces such as garage walls, pillars and parking garage columns can cause hundred of dollars in damages! PremiumShield is the toughest chip protection film on the market. 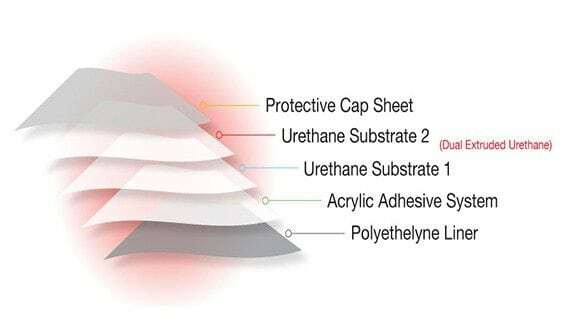 Combining excellent elastic properties and optical clarity with high shear and tack adhesive, PremiumShield is twice as stone-resident as the leader competitor. Will it diminish the appearance of my car? PremiumShield will protect your car for years and remains virtually invisible. Can PremiumShield be washed and waxed? Yes, you may wash and wax your vehicle as if PremiumShield were not present. Will my car face under the sun? Yes. PremiumShield uses a patented acrylic adhesive which can be safely removed without residue. PremiumShield is warranted against crazing, cracking, bubbling, or yellowing from UV exposure for so long as the original purchaser owns and operates the automobile on which the PremiumShield is installed; or five (5) years on PremiumShield film installations. In order for your product to remain in excellent condition year after year, and to maintain the conditions required to activate this warranty, please follow the care instructions below. Care Instructions: NOTE: Installed film must be left to cure for a period no less than 24 hours prior to being subjected to washing or other similar treatment. This will allow the pressure sensitive adhesive to cure completely and for any application moisture to evaporate completely. Immediately wash away any foreign material (i.e. bug splatter, bird poop etc.). If left on the film for an extended period, staining may occur. Wax and dust can build up around the edges of the film. TO remove, simply use a cotton swab dipped in 70% isopropyl (rubbing) alcohol and wipe away from the edge not into it. DO NOT USE: Solvent based cleaners; Bug removers or degreasers; Rubbing compound or any abrasive materials; High speed buffing or polishing equipment can be used, but on slow speed and with minimal force. We recommend testing a small bumper section prior to using on hood or fenders. *PremiumShield Elite Only. PremiumShield warranty limited to 5 years. PremiumShield Limited Warranty: PPF Distributing LLC warrants Premium Shield Automotive Paint Protection Film against discoloration, fading, cracking or bubbling. The warranty is valid as long as the installation is performed in accordance with manufacturer’s recommended installation procedures, it is not transferable. The warranty is limited to the replacement of defective material. The warranty does not cover any defects; including but not limited to — peeling, installation bubbles or mis-alignment, other than those specified. This warranty does not apply to damage to the product caused by erroneous application, accidental or negligent misuse, exposure to corrosive or abrasive materials, or by directed impact from road debris. If PremiumShield fails to conform to the warranty during the application period, purchaser may obtain replacement at any installation location worldwide where such an installation is carrying and installing PremiumShield Paint Protection Film. The obligation of PPF Distributing LLC under this warranty is limited to replacement of defective film; for which liability cannot exceed purchase price of said film. Proof of purchase will be required by the authorized installer to substantiate any warranty claim. Any purchaser desiring to assert a warranty claim should contact their orignial installer first hand. Proof of purchase, along with this warranty card are required for warranty service. Exclusivity: This warranty is exclusive and in lieu of all other warranties, expressed or implied, including but not limited to warranties of merchantability and/or fitness for a particular purpose. All other warranties, except those set forth above are expressly excluded. The said warranty envelopes PPF Distributing’s sole and entire warranty and no waiver, alteration, additions or modifications of the foregoing conditions shall be valid unless made in writing or signed by an officer of PPF Distributing LLC. Limitations: Some jurisdictions do not allow the exclusion or limitation of incidental or consequential damages or limitations on how long an implied warranty last, so above limitations may not apply to you. Except where prohibited by law, PremiumShield and the authorized PremiumShield installer shall not be liable for loss or damage arising from the product, whether direct, indirect, special, incidental or consequential regardless of the legal theory asserted. This warranty give you specific legal rights and you may have other rights which vary from area to area. The product is to be used in accordance and compliance with all applicable state or provincial laws. Installation of the product in a manner that violates state or provincial laws, or interferes with the operation of the vehicle is considered a misuse of the product and voids all warranties. NOTE: This warranty does not apply to automobiles used on a race track, in fleet, courier, livery, rental or other commercial or for profit service.